Warmer temperatures can only mean dining and drinking on one of the city's amazing rooftop terraces. Time Out lists seven bars to get a drink and a one of a kind view. 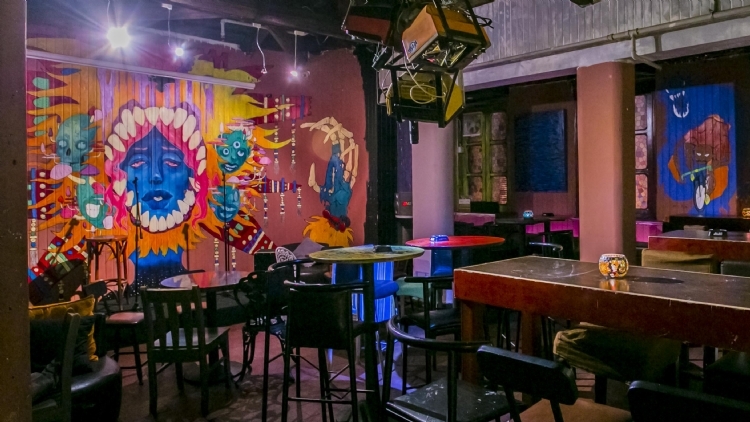 If rooftop bars don’t quite fit your budget, this list of Shanghai’s best dive bars should be good for a night out that won’t break the bank/Alipay account. 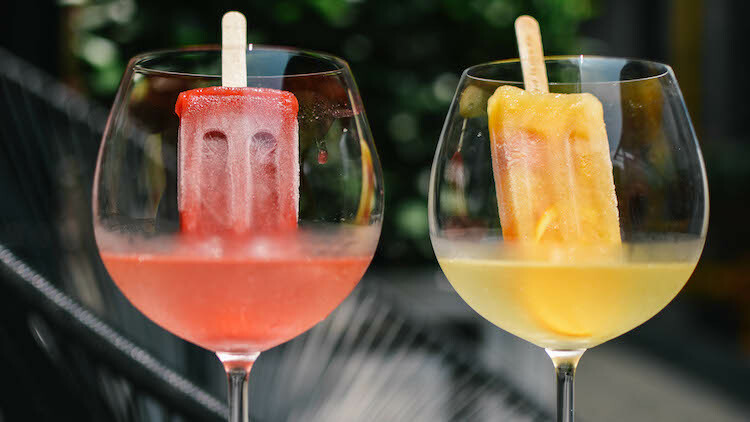 Alternatively, if you happen to find yourself wanting a daytime experience, check out this rundown of Shanghai’s best al fresco happy hours or list of frozen drinks to help you cool down in that sweltering Shanghai heat. 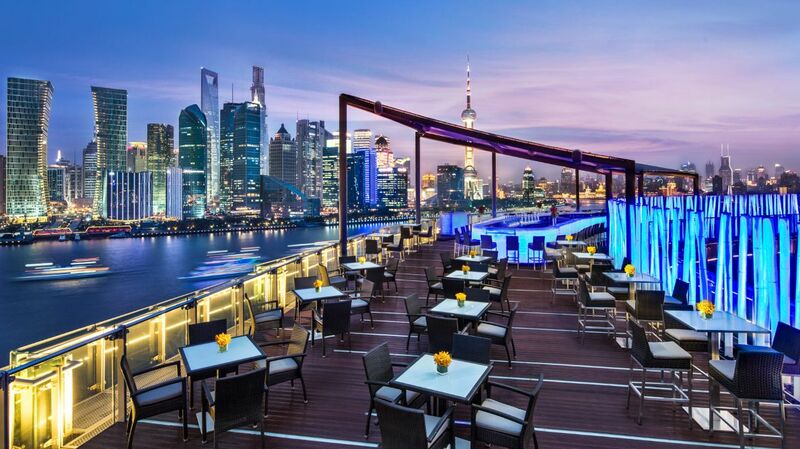 It would be impossible to write about drinks with a view in Shanghai without including Bar Rouge. 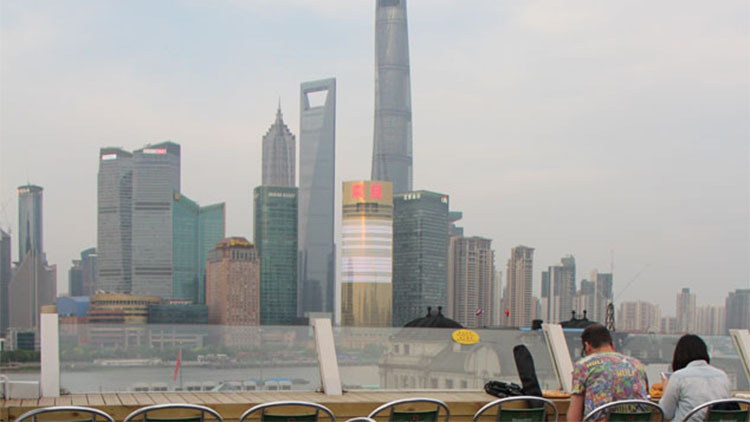 Yes it’s expensive and sometimes a little pretentious, but the large terrace is a wonderful spot to go and check out the Lujiazui skyline while sipping Champagne with Shanghai’s high rollers. The most recent renovation kept all the red (it’s not called Bar Rouge for nothing) and the traditional ‘Bar Rouge Muse’ (whose body is plastered around the inside walls, thankfully covered in just the right places). 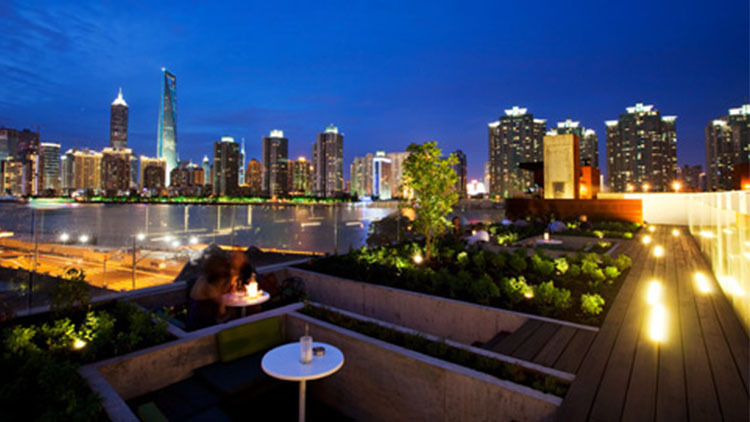 But head outside to the terrace for a more chilled out vibe and enjoy the bright lights of the big city. The Fellas, formerly known as Shen, at first looks like another swanky Bund-side terrace bar, but pretentiousness is cast aside in the name of good drinks, tasty food and a laid-back atmosphere. This is one of our favourite spots to take out-of-towners to admire the gorgeous Lujiazui skyline. From the drinks menu, try the signature Chinglish (88RMB) for a light and citrusy sip that manages to mix baijiu with lychee and melon liqueurs into a very palatable cocktail. Also worth a taste is the food menu including dishes such as smoked fish in cotton candy puffs (48RMB), a heaving plate of chilli-covered spicy Sichuan chicken (48RMB) and shrimp and avocado rolls (48RMB). 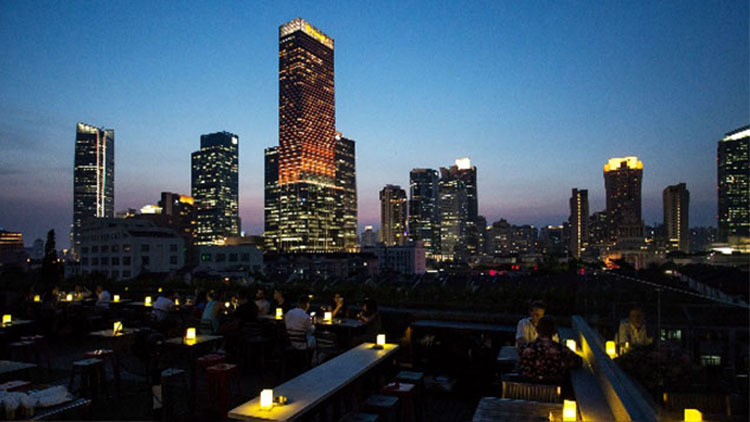 A cheaper alternative to some of the bars on this list, the Captain’s Bar (on top of the Captain’s Hostel on Fuzhou Lu) hosts a fabulous view over Lujiazui, but with drinks ranging in price from 50RMB for a dry Martini to 70RMB for a Mojito you get that fancy rooftop feeling on a budget. Enjoy the slightly kitsch seaside feel that comes from the life buoys on the wall and embrace this place in all its weird and (relatively) affordable glory. 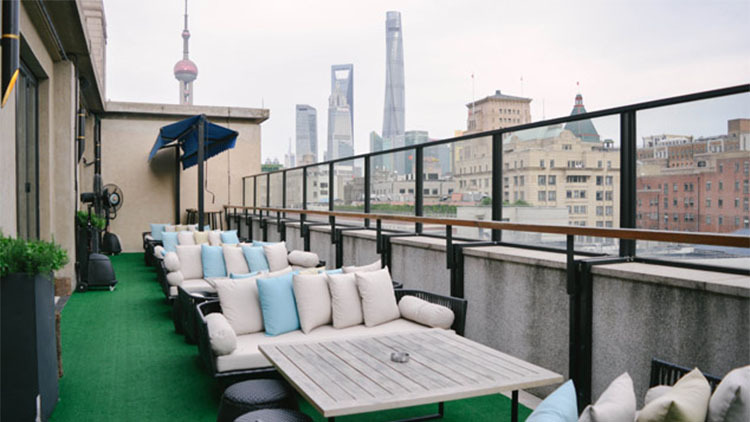 The slightly drab exterior on the corner of Xiangyang and Julu Lus doesn’t exactly scream sunshine drinking, but tucked away on the fifth floor is Kartel's huge terrace with a host of seats overlooking the former French Concession and the lights of Jingan. The hidden location means that it’s generally pretty easy to grab a spot, even on days when the weather would normally work against you. Most drinks hover around the 60RMB mark, but their 6-8pm happy hour features wine, sangria and Stella Blond for 25RMB and more. 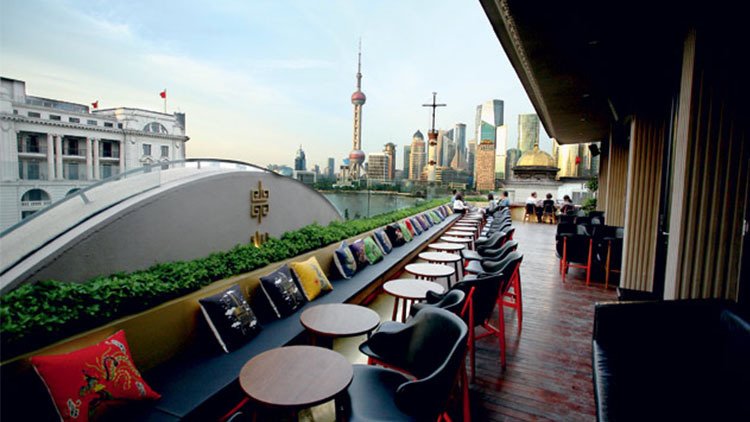 On the fourth floor of uber cool hotel The Waterhouse, The Roof at Waterhouse is one of the more relaxed spots to enjoy a drink with a view up the Huangpu River over The Bund and across to Lujiazui. Located further south than some of the other venues on this list, drinking on this terrace feels further removed from the action, but in a good way, contributing to a laidback vibe. With innovative cocktails (from 85RMB to 95RMB for a house special Vitamin C Vesper) and tasty bar snacks, this place is a destination in itself, but if you’re in the mood to make a night of it in this gorgeous and stylish hotel, head downstairs to Jason Atherton’s Table No. 1 for dinner and enjoy some seriously good modern European food. While we all love the classic Huangpu vista, the balconies lining three sides of The Nest provide a different view of Shanghai’s cityscape. It’s this interestingly urban perspective, plus the quality food and drinks that make this bar wor thy of a spot on this list. Head here for cocktails such as the Grey Goose le Fizz (58RMB), a sweet, alcoholic take on lemonade, and the Cinnamon Pear Sour (78RMB). The food deser ves a look in too, with chef Freddy Raoult at the helm delivering a wide array of seafood, including fresh Fine de Claire oysters (198RMB dozen or just 98RMB on Sundays and Mondays). Still hungry? There’s also a whole lot of meat available, including sharing plates of wagyu and Iberico (from 198RMB-298RMB) and a 1.5kg cote de boeuf (698RMB). 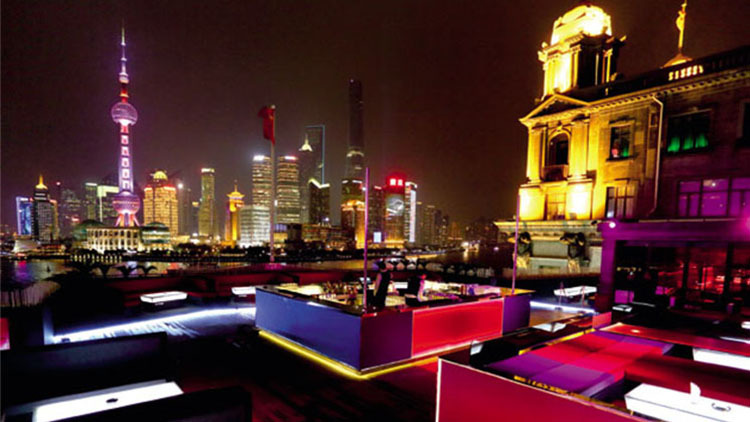 Another popular place to take visitors for a sky-high drink is Hyatt on the Bund’s VUE Bar. Just north of Suzhou Creek, the view from the 32nd and 33rd floors is breathtaking. 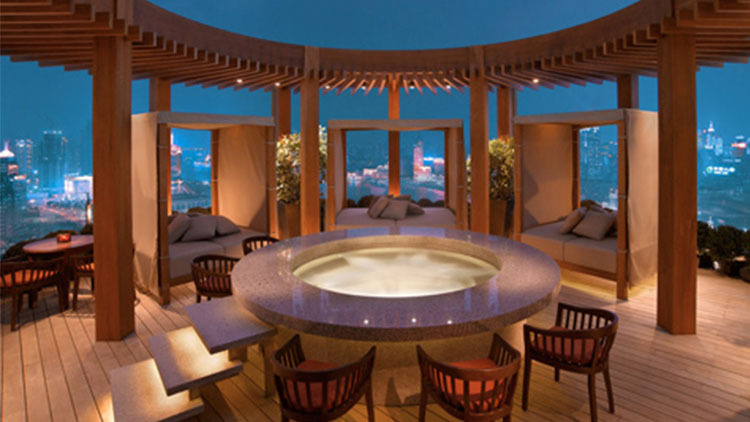 On the top level, they have an open-air terrace with daybeds surrounding a Jacuzzi. While the outdoor area and window seats get busy as the evening rolls on, VUE Bar currently opens at 2.30pm on Saturdays and Sundays, and is generally a little quieter around this time. Head down a couple of floors to level 30 and you can enjoy the views while dining in the VUE restaurant. Try their Sunday brunch with one of the best views in town and indulge in free-flow Perrier Jouet Champagne (688RMB plus 15 percent) and a wide range of dishes made fresh at the various cooking stations. 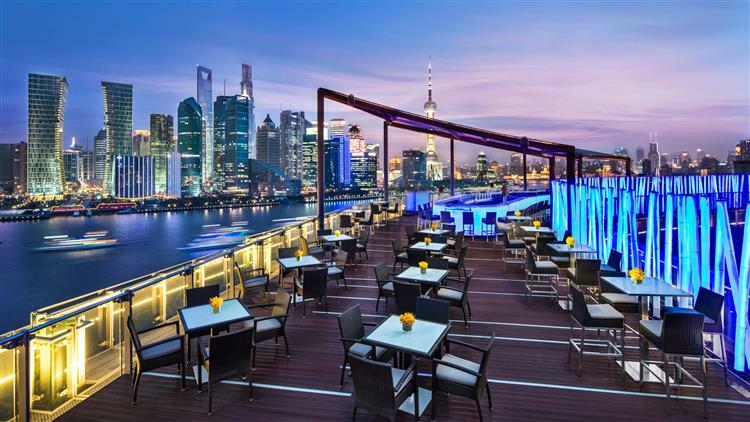 This glamourous rooftop bar atop the Banyan Tree Hotel has one of the most impressive vistas in Shanghai, with 180 degree views up and down the Huangpu River and over The Bund. Drinks start around the 80RMB mark for a glass of Zonin Classici Pinot Grigio/Chianti, up to 150RMB for champagne cocktails. Food is also available if you’re feeling peckish; the chef’s specials include two types of Caesar salads, the first topped with grilled king prawns and the second with Cajun spiced chicken (both 198RMB). Despite the sometimes patchy service, it's the perfect location to watch the sun go down over Shanghai.